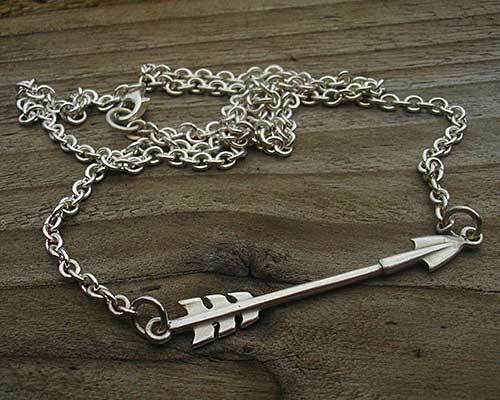 Robin Hood Silver Arrow Necklace : LOVE2HAVE in the UK! We think most of our customers will have heard about the famous English legend of Robin Hood and his band of Merry Men who robbed the rich to help the poor. This most famous of outlaws lived in Sherwood Forest, and his arch rival was the Sheriff of Nottingham who most famously devised the silver arrow - a clever trick to capture Robin Hood. Here we have our very own silver arrow necklace made entirely from solid sterling silver in beautiful intricate detail complete with tail feathers and pointed nose tip. Eyelets securely hold its slender design in a horizontal position coming threaded onto a silver chain which as standard comes in an 18inch length.